Wanted to share a picture of Midas with you! He is now 3 years old and so beautiful, very smart, and just a tad ornery which gives him his little personality. We love Midas very much! 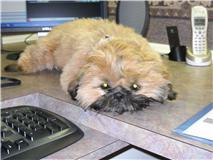 His vet loves him too, when we visit he is the King of the office. 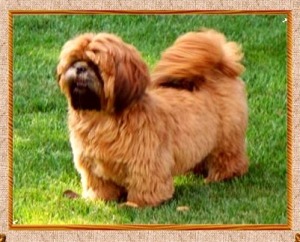 Dr. Lori is always complimenting his breeding, health, and temperament. She is amazed by his beauty. Midas still loves to snack on carrots, broccoli, apples, and bananas. 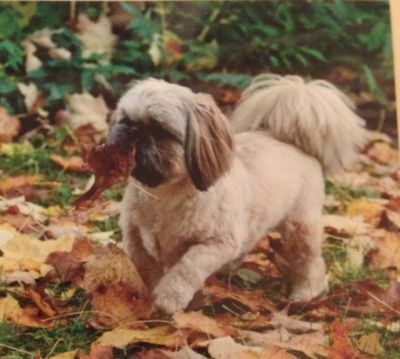 Our story starts one and a half years ago when we lost our first and most beloved shih tzu Corky. 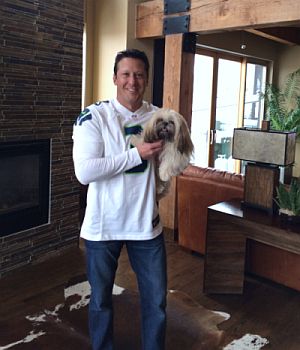 All dog owners know how hard that loss is, and if you are strong, you move on and find another dog to love. 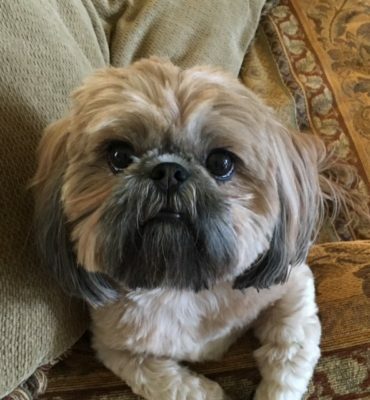 I spent over a year looking to rescue another shih tzu, not a puppy as we are older. Hoping to find a dog within driving distance (Washington DC) so we could see the actual dog and meet with him or her before making the final decision. Small dogs are sent here from the southern states and West Virginia regularly, but they seem to be adopted before their little pictures appear on internet. We registered with several groups, had people interview us in our home and but were never able to actually find a dog before they were whisked away. All our inquiries ended the same. so sorry she was adopted. Out of frustration I started looking for breeders, again within driving distance, not really wanting another puppy as we would like to outlive our dog. Then I found Twana’s site—it’s a good site with lots of info and lots of pictures. Whoa! What’s this? Adult dogs for sale? 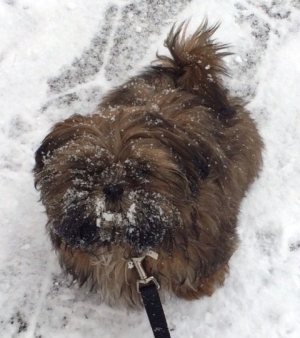 There she was, our new dog Bubbles, looking as cute and adorable as any dog I had ever seen. But Twana does not just let you buy her dogs (old or new) without interviewing you too. She places her dogs in appropriate homes with appropriate siblings and you and your other dogs must meet her tests. If you pass her tests and are very lucky, you will be allowed to take possession of one of her beautiful, healthy and very smart dogs. There is no question she will not or cannot answer, just ask. Hi Twana,> How’s life? We have had a ball with little Rainy…what a character she is! She is spunky, confident and very smart. She is also totally adorable and loving. I hope all is well with you and all the pups! Joe and I would like to give you a glowing recommendation. Thor is so very smart and sweet. He is such a charmer. As you can see from the pictures, he’s settled in nicely and enjoys being the center of attention. When I picked him up, I was very impressed with all the time, care, and love you obviously give to your dogs. Little Zoe is all we could have ever asked for and so much more. She is lovely. She is so precious and sweet. She has stolen our hearts. She is loving her new home. She is curious and wants to explore. The first day, she was so unsure and you could sense her hesitation of her boundaries. Now, she’s everywhere! She is on my heels every step I make. She’s eating really good, drinking her water and going potty really good. She’s playing and chewing and running and she almost hops sometimes. She looks at us with those beautiful eyes and we melt. She kisses and snuggles. And then she’s running wild and playing. She’s an ornery little thing. I know without a doubt, she was the one for us. After all these months, when I wanted every one I saw, I knew, we knew when we saw her that she spoke to our hearts. I believe in destiny and I believe she was meant for us. Every day when she was not already sold, I knew that if I let her go, we would regret it forever. She is perfect. Thank you so much for the hard work that you do to bring so much joy to our lives and others. Your not just producing beautiful puppies but you are giving people hope, love and joy thru these beautiful angels. Thank you so much. You are a beautiful lady with a wonderful heart. Thank you so much for everything! I don’t want to loose touch. I hope you have a wonderful Sunday. Thanks so much for Raja Kumar (Little Prince). He is everything we could have hoped for: super sweet disposition and absolutely gorgeous. It was great working with you—I really appreciate the time you took to answer all of my questions. Thanks again for doing such a great job. I’ll continue to refer people to your website. I thought you may like seeing a picture of Reva. I hope you remember her. She is just the sweetest, most loving dog and we love her to pieces. Love her!!! She’s litter box trained too. Smartest little girl. Thank you very much for the wonderful puppy!!! I love her to death. I know that you do what you do for a living but I wonder if you ever step back and realize all the joy these little guys have brought to all of your customers over the years. I cant even tell you how much I love little Bella. She is just the best and has been so healthy. That is so important. She still gets a little yoghurt every morning . !! Keep up the good work and have a very merry Christmas. Who knows I may be back for another one. Buster Got His first grooming last Saturday. Has all his shots. Is a love. Groomer says he is an energizer!!! He was very impressed by Buster! We are blessed. I just love this little peanut!! Thank you again for this loving gentle playful energetic happy fellow. Hope Christmas was wonderful for you and best of everything in the new year! 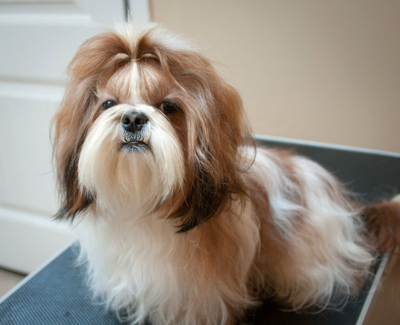 I’m sure your grooming endeavor will be as successful as your breeding experience! You are an amazing lady!!! Thank you for the holiday card and the health card about Lil Buddy (now called Willie). Hope you and your family are doing well. 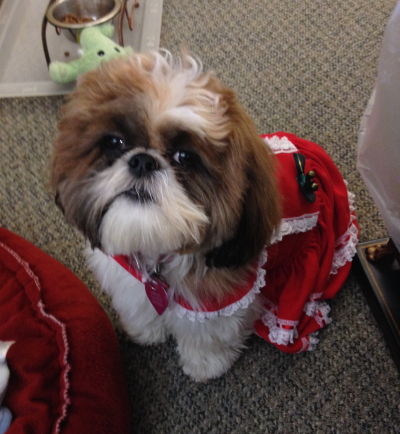 We are celebrating our 4th Christmas with Bella. We just love her to bunches. 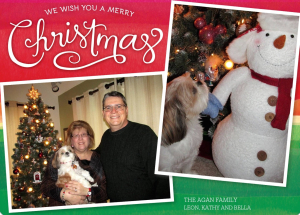 Merry Christmas from our family to yours. Remember me? Its Weston! I haven’t seen you in almost a year and I miss you! I’m so happy in my new home. My mom renamed me Bronx Beso and she takes great care of me. I’m her baby! Thank you Twana for such a beautiful dog. I am so in love with him! He is so sweet and I don’t know what I’d do without him. He was the best gift I ever bought myself! I just wanted to send you a pic of him and keep you posted on how he’s doing a year later. Take care and God Bless. Roger Caras once said, “Dogs are not our whole lives, but they make our lives whole”. This quote could not be more true. When Red Satin arrived last Fri.,03/09/2012, at 5:45, we could not have been more delighted! This four year old baby could not be more of a precious bundle of joy. She has fit right into our family. 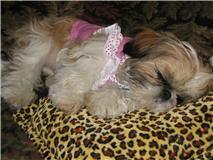 Our two other Shih Tzu’s have taken her in and accepted her as part of our family. We can tell she comes from exceptional quality. Sha is a very fast learner with a wonderful attitude. These are all derivaties of a great emotion called, love. Twana, you are an extremely motivated and loving person to give us this gift. We are so fortunate we found you. 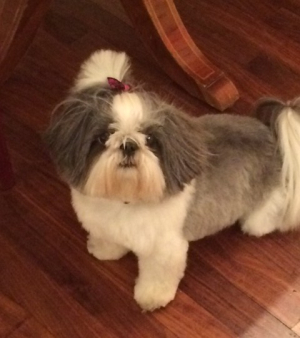 I am writing to give you and your Shih Tzu an A+, thumbs up recommendation. 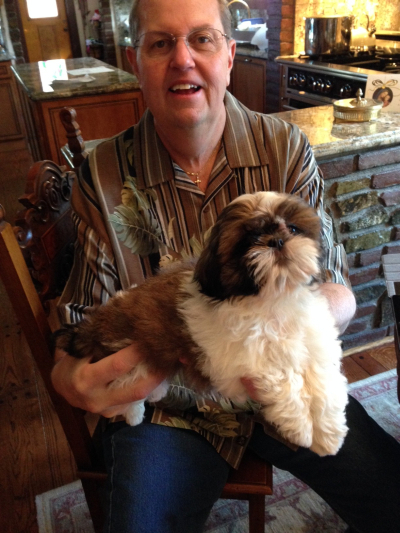 I am an AKC Licensed Judge (Shih Tzu, Collies and Jr. Showmanship), and I have bred and shown Shih Tzu in breed and obedience since 1971. 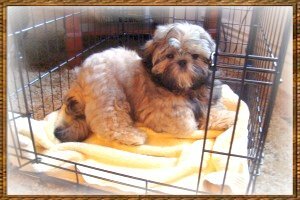 When we lost our little Shih Tzu girl in December, I decided to check around for puppies that would be available in the spring. None of my usual contacts had puppies available. In searching on-line I happened to come across your website – shihtzutreasures.com. There were several photos of a black masked solid red puppy named Breezy who I just fell in love with. I could tell from one of the photos that this little girl was special and gorgeous. My daughter and I drove 675 miles from Connecticut to Ohio on May 24, 2011, and the next day went home with her. She is everything I had hoped for. 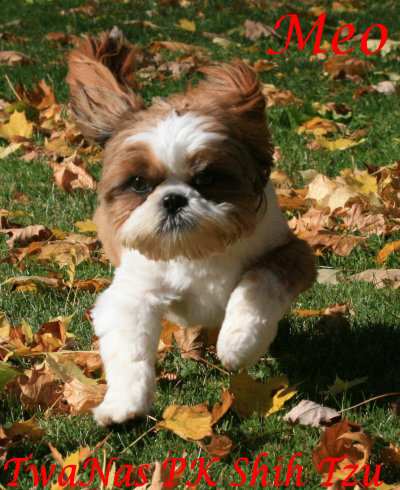 Gorgeous color, beautiful head, eye and expression, very true to breed type, lovely movement, but most of all, true Shih Tzu temperament and personality-plus. She is extremely smart and learns very quickly. 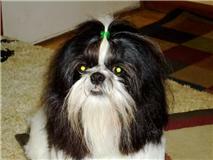 Even though she isn’t from my own line, she is a lovely girl and she will be shown in breed and obedience. Her official name is now Twa-Nas Faerie Dean Cocoa Puff. 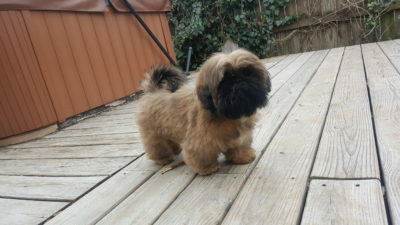 To those looking for a puppy, we met several of Twana’s other Shih Tzu and they were all what we call “a tongue (to lick you with) and a wiggle (the tail wags the dog)! They were all clean, well groomed, well loved, and loving. Those we met had good type, and exceptional personalities. 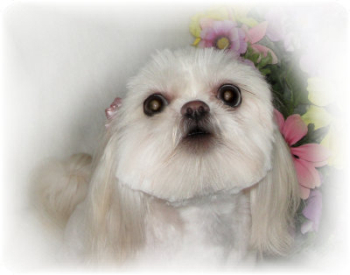 I am very particular about my dogs, and I guess I went to the right breeder to find one. 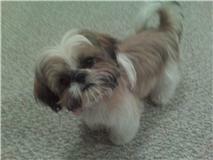 If you are just looking for a nice pet, I would recommend Twana’s Shih Tzu. 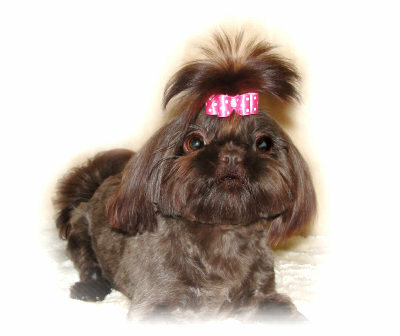 And, like any good breeder, she occasionally has that special show quality puppy, like my Cocoa. Sorry for the delay in responding. Miss Dollie(MayMay) is doing great. She is sleeping through the night and potty training is going so much better than I expected. She responds to watch me and sitting already. SOOOOO Smart. We love her so much. The ride home was PERFECT. She slept, played, and pottied on the blue pad. Could not believe how well it went. She went to the vet the next day and he checked her all over. She does have a hernia but will take care of when spade. Checked her bowel and NO worms. But I was not worried!! He told me that her breeder must really took care of her puppies because 90% of puppies that come to him have worms. I told him she was the best and was very cautious about who was around her dogs. Thank you so much for everything and will send pictures soon. How are you today? It was a real pleasure meeting you and just wanted to let you how much we enjoyed our visit with you and your grandson. Our little puppy is just adorable! You obviously know your puppies and their personalities extremely well. Our little guy is just as you described, lovable and very playful!! He’s fitting in perfectly, and we just love him to pieces. He did very well during the 12 hour car ride back home. He actually seemed to enjoy it and was not sick at all. We have an appointment with our vet scheduled for May 31st. It was the earliest appointment that we could get. Could you give us the name of the shampoo that you used on him. 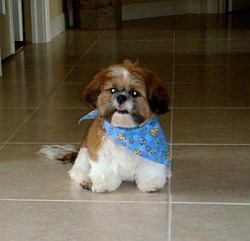 He was so soft and fluffy and smelled so good when we first got him. We are so happy with him and we know we made the right choice. We will let you know how the vet visit goes. Thanks again and God Bless. Haven’t heard from you since we got little Penelope! Anyway, we got our engagement pics done and had some taken with the babies….I have attached them so you can see how much Penny has grown! They are best friends and we love them more than words 🙂 Thank You for both of these little dolls! Merry Christmas! 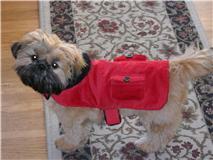 Just wanted to send you pictures of Bentley (Dillon). He is a wonderful pup and seems to love his new home. We certainly love him! Hope you have great holidays! THANK YOU THANK YOU THANK YOU for giving me the best dog in the world! 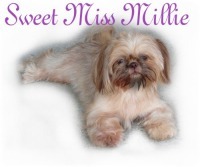 We just wanted to let you know how wonderful Millie is and how delighted we are to have her. She is such a sweet loving dog with the loveliest personality. She is wonderful with the other dogs plays and goes outside with them. She was easy to bath and brush showing she was used to it and pranced around afterwords, just so happy to have had her “spa” day. She is still getting used to our little one but stays out of his way rather than be aggressive in any way. We finally have heard her bark a little, she has been so quiet and calm and relaxed. She loves to sit with us and give kisses and be cuddled and petted. She is just perfect for us and I wanted you to know how thrilled we are to have her. Hi Twana! 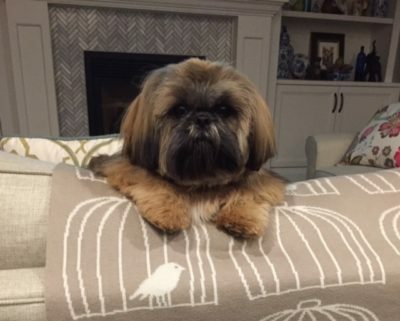 We are thoroughly enjoying our shihtzu. She is everything you said she would be! She is loving, smart and very playful and yes, she does the double paw pounce like her mommy (Red Satin) did – so adorable. I will get a picture sent to you one of these days. She got a hair cut a week ago and has a shorter cut than I wanted so no pictures until the hair grows some! We decided on Reagan as her name and she weighs 10 lbs now. She has brought us much happiness and lots of laughs. She seemed to settle in here right away and we believe she likes it here! We know we made the right choice!! Thanks for allowing Reagan to be a part of our family!! 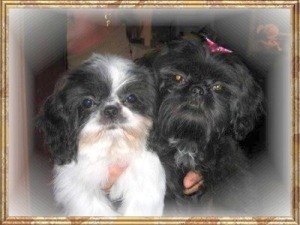 I don’t know if you remember us but we are Peggy and Frank Rubino, we purchased Kissy, now Jasmine and Logan from you. Just to let you know they are doing fine and are the light of our lives. Logan has a personality of his own, he is not afraid of anything, he try’s to play with other dogs that are ten times his size and he has no fear of anything, and Jasmine is a wonderful puppy to have in our family. They are just the greatest to us. Hi! Just wanted to let you know how happy we are with our new puppy! Her personality is everything you said she would be. She has been so much fun and has brought us many laughs. She is getting more spoiled every day but we all feel she likes it here. 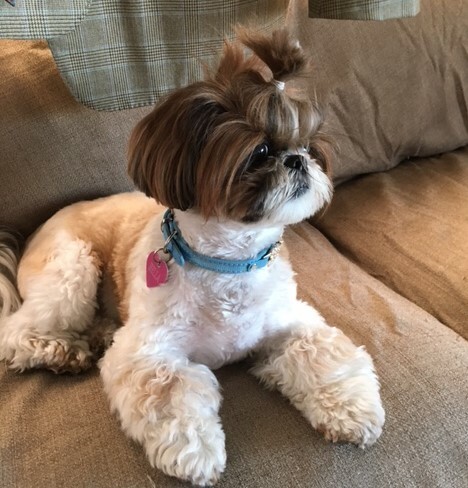 We think she knows she runs the show! She does not want to sleep in the pen, whines & barks until she gets out and sleeps on the couch with whoever has night duty! I think her name is going to be Emmie but not confirmed yet. I just wanted to let you know that Dolly is doing really well and I am loving her more and more every day. Her confirmation is gorgeous and her color I love too. She has been sleeping with me every night and is starting to play with my Sadie. Sadie has a real problem with keeping her weight down, so Dolly playing with her is so good for Sadie. Thank you so much for Dolly. Tai is doing great! We love him so much! He definitely has the attention of the whole family. I thought you might like to see some pictures of him. He has put on 1 pound – weighs 7.5 pounds. I just wanted to give you an update on Karsen. I’ve started calling him Boo and he’s doing really well! He’s so darling and cute and funny. He’s started snuggling underneath his bed and walking around with it on his back like a turtle. 🙂 Everyone thinks that he’s the cutest puppy and he’s been really adaptable and friendly to everyone. He even made it through a trip on the subway with flying colors! Thank you so much for this wonderful puppy. He’s already become such a big part of my life. Thank you again for being patient with me throughout the whole process and being so accessible all the time. I really appreciate everything! I hope you’re doing well and I’ll send pictures and give you a call soon! Hello TwanaJust wanted to let you know that the puppy is doing ok and she is adorable.I love her so much,she is very affectionate and smart.We took her to the vet and everything is fine.She is getting used to dry food and is getting her teeth.I’ll keep you updated.Thanks for everything Twana. Just wanted to thank you for a wonderful dog. We got Hayley from you two months ago. She is an unbelievable dog with a great personality. She is smart sweet and a great addition to our family. Have a happy and healthy holiday. Twana Sue: Hope you are doing well and have a wonderful July 4th! Don’t know if you remember me, but I purchased Midnight Star from you – she was delivered by air on November 6, 2008. She is a wonderful dog and we absolutely love her to pieces. Just a little update, she is mostly black with a brown face and has a little bit of gray throughout her coat. We think she is absolutely beautiful! Her face is so sweet and everyone tells us what a pretty dog she is. I need to send you pictures for your website. She is the sweetest dog I think I’ve ever been around. She loves everyone – including other dogs. She always wags her tail at everyone. I can’t tell you how happy she has made my husband and I. My husband, who really didn’t want me to get a dog, couldn’t imagine life without her.Thank you for everything Kelly! I wanted to send you an update on the boys. 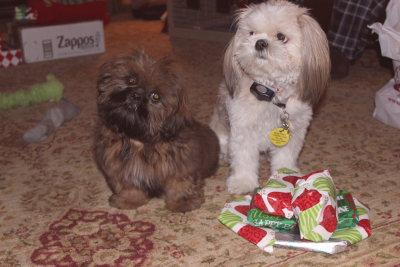 Rusty and Pistol Pete (Rascal – he got a new name) are doing very well. Rascal is getting big he is almost as big as Rusty now. Rusty is still in charge for now. They are wonderful together. They play all the time and sleep on top of each other. It is so cute. Rascal lives up to his name. He loves to play and is very energetic. However, if my daughter (his owner) picks him up he is happy to snuggle with her for hours. I don’t think she could love a dog more. Rusty has been claimed by our younger daughter but he is my boy too. He is so sweet. We have started training them to walk on a leash. The vet gave us the ok to walk them in the yard. They are doing well and love to walk with the leashes in their mouths. The vet wants us to wait until Rascal has had all of his shots to walk them in the neighborhood so it is the yard for now. We are going to schedule them both to be neutered at the same time probably in November. Rusty has an umbilical hernia that needs to be repaired as well. They are definitely part of the family. I will get some of the pictures with the girls uploaded and send you one. Rusty looks a little like a mop right now. I need to give him a haircut. 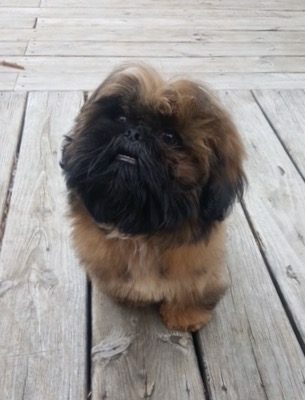 We still have about a month to go before he could go to the groomer. Hope you are doing well. I wanted to let you know that we got home safe and sound with our precious cargo (Barkley). He seems to be adjusting well … he’s very alert, loving, and playful. He already knows to potty on a puppy pad in the garage. I took him to the vet today to be checked over … she said he is an excellent puppy … very healthy and alert, great joints, clear eyes, clean ears, wonderful temperament. She gives YOU her compliments … she said she could tell that you knew what you were doing, and you did an outstanding job in raising this little guy! 🙂 She gave him his second set of shots, trimmed the hair around his eyes, and trimmed his nails. Anyway, Twana, we were absolutely delighted to meet you Saturday, and we truly appreciate all your hard work and dedication in breeding such excellent quality dogs. Once folks see this little guy, I’m sure they will want one of their very own … and we will definitely recommend that they contact you. And, should we decide to get a second one at some future time, we will getting it from you! May God richly bless you and keep you in his fold, Twana, it’s not the house that makes the home, but the love one feels when they enter that house … and we definitely felt a lot of love! 🙂 You are a good and kind person, Twana, and it certainly comes through in the puppies you place. We are very happy and pleased with our little guy, and we can’t thank you enough. Our best wishes for a wonderful life. 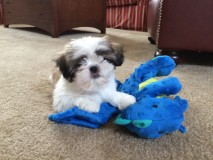 I wanted to let you know how the puppy I purchased from you last April is doing. She has been heaven sent. She is just adorable. Very smart and has adapted to my schedule well. She is pretty fearless and has many four-legged friends (seems very attracted to Bijons!). There is a large walking area where we live and many people in that area have dogs. She walked a lot better in the winter with the snow. Spring fever kicked in over the weekend and she is back to stopping and sniffing everything and sometimes just lays down to take the scenery in. She’s something else. Well, I just wanted to let you know that I couldn’t be happier with her. Hi Twana!!!! Benjamin is the best thing that has happened to me in awhile. He is the best companion sometimes he thinks he is human he is just so intelligent and everybody says he has the cutest face ever and he get lots of attention. Ben is so full of love and he loves to play and believe it or not he loves snow – the deeper the better we have a cabin in PA deep in the woods his vacation spot. Thanks for being such a great breeder of wonderful babies. I will send photo soon. oh my gosh! Do we love her!! she is absolutely gorgeous!! and what a perfect disposition!! Thank You so much. We will send you a picture of her new family later, maybe yet tonight!! I hope you are doing well. I think about you often and I continue to pray for you and for your family. I just want you to know what a blessing our little Gracie is to us. She is so loving and sweet. I have never had a dog before so it is all new to me. I have learned that the work you put into a dog is worth the love that you receive in return. I also have a real appreciation for your job of taking care of all your dogs. I see how much work it is for one dog and I have much respect for you taking care of many dogs. Thank you for your expertise of breeding that you gave us a wonderful dog. I wish you could see her. She is about 6 pounds. Her color is beautiful and her coat is so soft and fluffy. She loves people and she loves to go places with us. She is also very smart. She learns very quickly. Twana, I truly believe that the Lord helped me find you and I will always continue to pray for you. 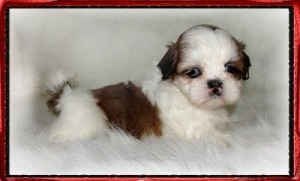 I will send anyone I know looking for a shihtzu puppy to you. I would love to know how you are doing and how all your dogs are doing. I keep checking your web site so I can see all the new additions to your family!!! Thanks again for our Gracie!!! We are so in love with our new dog. It is unbelievable how sweet, cute and smart our new little sweetie is. She has the best personality, and she adjusted so quickly to life with us and our 2 & 4 year old girls. It was worth the 8 hour drive with 2 little kids! Thank you….. In Love in Pennsylvania…. Just wanted to send you a quick note to tell you that all is well with our little puppy. We have named him Bentley and things are going great. He went to our vet on Sat. and got all of his vac. and a clean bill of health. He has learned to sit, shake, and is doing great with potty training, We are so grateful for all of the help and info. that you have given us. You have given us a gift of love in a little black package named Bentley. Thank you so much for sending me this. 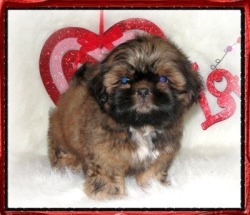 I have a friend who’s husband is trying to talk her into getting one because he loves our Mitzie so much! I will forward this onto them. I have been meaning to write to you to tell you how very much we love our Mitze. We lost our Baby back in December, and my husband I know thought he could never love another like he loved Baby, but guess what!!! He is nuts about her, she looks like your Precious now. She goes in every two weeks for grooming, where we took Baby, they can’t believe how much she is like him in personality!!! 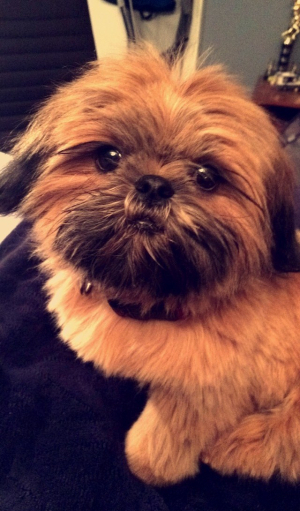 They groom a lot of Shihtzus, but she is their favorite. She is much more loving than Baby was even, your website (as I remember) says they males may be more affectionate, I would hate to think what that would be like, it doesn’t seem possible. When I come home she will not leave me alone until I pick her up, and she is like that with anyone who comes over. I just want to thank you again for leading us to her, she is the joy of our lives!!!! I didn’t want to call because I know you’re BUSY but I wanted you to know how much we LOVE our new baby ! We named her Sophie. She fits right in. All of the adults are mothering her & she has 1 puppy to play with. She sleeps with me every night. She’s doing great on the potty training. She’s eating good & drinks a lot of water. I couldn’t be happier ! She’s going to the vet tomorrow for her next shots. I’m making Larry take her. I don’t want her to get mad at me ! She’s such a lover ! My son wanted to take her with him for a week. He’s in love too ! You did a great job with her ! Thanks so much for our little doll ! 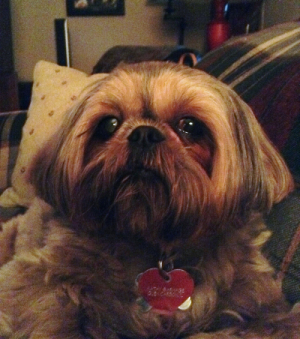 We wanted to send you pictures of our Abbie Mae. We’ve had her for almost a month now and she is the sweetest little girl!!! We can’t thank you enough for our baby. She weighed in at 3 lbs even at her last vet visit and is eating and playing like crazy. We love her dearly. Have a wonderful Easter! 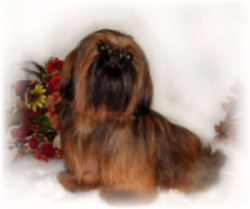 I had looked for a Shih Tzu for a long time before discovering Twana’s website. 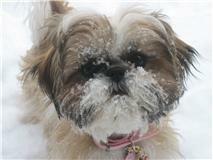 I was captivated by the beautiful dogs, and her attitude in “life-long” responsibility for pet-owners. I had many questions for Twana, and she took time to respond, even though I know she is busy. I was wanting a particular type of dog to use for agility, and she was very patient and honest with me. We corresponded for almost a year before we brought home our puppy. She was so good to work with, I recommend her highly. Lola has been everything I dreamed of in a puppy. Her conformation is excellent, her attitude wonderful. She is willing to please and obedient, which is so important in training. She also is beautiful, and has no health concerns (something I think about because I work in a vet clinic!) Lola is a loving member of our family, and she was worth the wait. Twana’s puppies are wonderful! 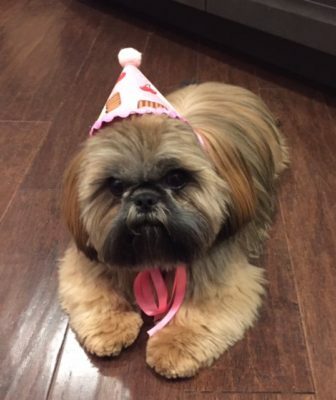 Well, it’s been 1 year since we brought Sammy home. Hard to believe?!? Thought that I’d give you an update….. SHE IS A TOTAL DOLL BABY. (but you knew that!) She has settled into our home and hearts very well. She is a very good girl and is quite obedient. She always comes running when I call her. She’s OK with being second in command. Our big dog (a 70 lb Italian Spinone female, Biscotti) is very gentle, but, is definitely the lead dog in the house. Sammy and Muffin are so very close that I don’t know what each would do without the other. They lick each other’s faces, sleep curled up together(at the foot of my bed, of course! ), and occasionally race around the house together like whirling dustballs. 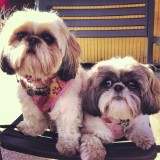 Needless to say, they are my babies…… ShihTzus should really be placed in pairs! They are an absolute riot together. Thank you again for letting us take her home. We love her so very much. Hope all is well with you. I’d love a puppy update if you have a minute. We still log-on to your site at least once per week to see what’s new. They are totally perfect. The little red one has such a nice short back, and long neck and good legs and perfect tail and awesome markings, seems like she would be a great show prospect. They are so energetic, and they are sparring for alpha position. My older girls are hiding under the sofa in the office all the time, and Bo is cautious at best. Your girls love to chase him and he seems to set himself up for being chased. SO great!… I will send some pictures when we can in the next day or so. Thanks for everything!!!!! Happy Thanksgiving! I was thinking about you and wanted to tell you thank you for Elliott. He’s a real blessing to us. Your friendship is also a blessing to me. I appreciate all your advice and tips. I want you to know that I keep you in prayer often. This is the time of year that we should tell God and others just how grateful we are-and I’m grateful for your friendship. Thank you, also for sending me e-mails with your top puppies. One of these days I will be able to buy one or two or three… Jim and I admire the quality of your dogs and we would like the opportunity to have more of your puppies in the future. I hope you holidays are special for you. I thought it was about time that I write you and let you know that I am so very happy with my dogs I have received from you. The first two I got have turned out to be just beautiful dogs and I love them so very much. The last two I have gotten are the love of my life also. You have been so very kind, I value all your help with my 6 babies. 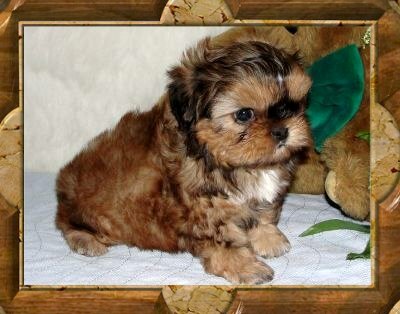 I have waited along time to get just the right Shih Tzu. If there is ever anything I can do to repay you for all you kindness and help please let me know. I will send you pics from time to time to let you know how all the babies are doing. Twana is one of the nicest, warmest, sincerest breeders that I have been blessed enough to meet. 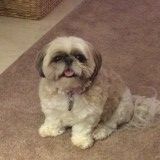 I have purchased from her several times and have always been delighted and totally satisfied with her puppies as well as her prompt response time to questions or concerns. 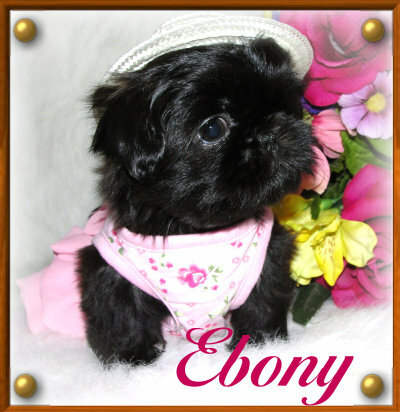 She is a wonderful, caring breeder who has taken the time to produce wonderful puppies and build a great line. She is not only an excellent breeder but a wonderful friend whom I have come to know and respect. Just an update on Cooper, he’s adjusted fantastically to Ct. He ‘s such a cutie… it’s hard to believe we’ve only had him a few weeks! He fits right into our family with tons of love and kisses… What a beautiful dog! The fact that he was paper trained from day one made the transition easy!! 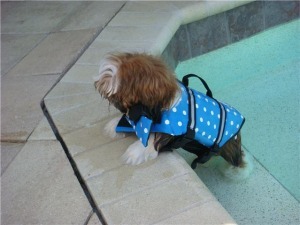 Thank you soooo much… he’s now trained for outside and does great! We all love him and couldn’t imagine life with out him. 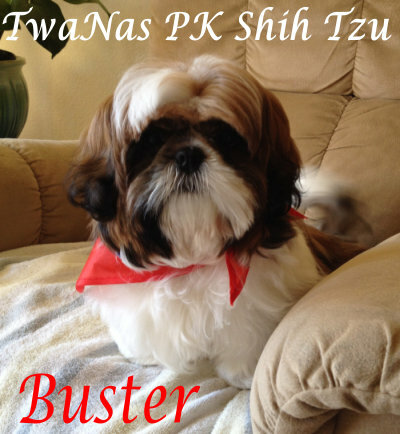 Thanks Twana for instilling your love for Shih Tzu into all your pups!! I’ve recommended you to many!! Jorgi and I just returned from our vet visit. Our vet said he is a “beautiful specimen”, and gave him a clean bill of health–strong heart, no worms, boy parts all there! He weighs 5lbs already! Our vet was extremely impressed with your breeding practices and said you must be a very ethical breeder, something he said he sees far too rarely. He is doing just great. He already knows his name and comes when called, doesn’t seem to be bothered by much, and is just loving the kids. He is house training well and loves to just stay by our side with us. He did great in his crate last night, no crying at all. We can’t thank you enough for giving us our lovely baby. 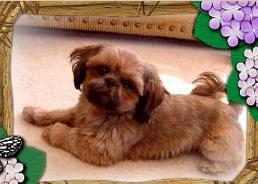 I have purchased 5 Shih Tzus from Twana. We started out e-mailing each other in early 2000, after I found her website . Since that time , we have formed a close friendship which I value very much. Twana Blatz is a woman of Integrity. Her word is true. She means what she says, and says what she means. I have deep respect for her as a single mother and homeowner, raising her children and living each day walking with the Lord. Her home, family, and dogs are well kept and cared for. Twana is an honest, compassionate and caring person, with a great love for her dogs and the integrity to be honest and straightforward. She let me know the good and bad points of each of my dogs. All of them are healthy, well-bred, and are wonderful family members. 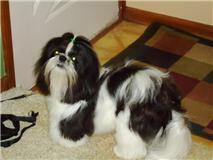 I have had many beautiful puppies from Twana’s bloodlines. All of our financial transactions have been professional and beyond reproach. All paperwork and medical information has been meticulously kept, and she has taught me how to professionally keep my breeding and sales documents. She has helped me whenever I have asked for advice, and has been generous with referrals and any help I have ever needed. 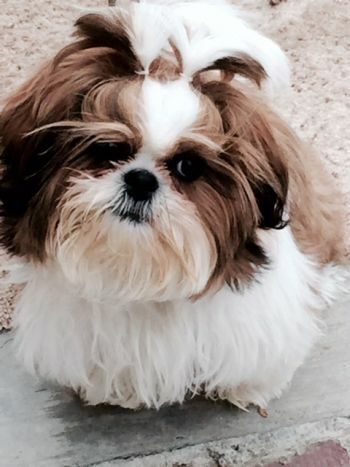 If you are looking for a puppy, and you are lucky enough to come across Twana’s site, you have found a Shih Tzu breeder who will make sure to help you find the best Shih Tzu for you and your lifestyle. She will be there to answer your questions and offer support long after the money has changed hands. Feel free to contact me personally. I am happy to give Twana and her dogs a positive referral anytime! without him. He is very happy and has so much love to share. was meant to be with us. We have been blessed by having you in our lives. Hi Twana, sorry it took us so long to get back with you. The puppy is doing SUPER!! She is such a joy! Mom has decided to name her : Phil’s Fancy Angel. We are calling her “Fancy”. She is such a card, LOTS of personality. Haha. She is growing and eating well and is practically totally potty trained now. Mom has been so diligent and dedicated getting her trained. She was getting up every 4-5 hours with her to make sure she got out to go potty. She loves her to death and the vet said she was in excellent health. She is just so cute. Don’t worry about her she is living the pampered life:). Take care and Thanks!! Kisses is just doing wonderful she is such a sweetie .Sorry to worry you.She got in Sat night we had our first rainstorm.And she was a little scared .But I have to tell you when she seen my 10 year old she just Bonded and it was love at first sight. The first thing my daughter said was Shadow and the two have not been apart since.Then my daughter decides to spring clean her room and make sure her room is puppy safe so she completely takes every thing out of her room.At 10 we are not arguing so that was why I didn’t even get to my computor.But I told her that I wanted to write you to let you know she is doing good she said “Could you please tell her that I Love her soo much and Thank her for my Baby she is doing good and she sleeping with me”Well there you have it from the mouths of babes .I would like to say thank you for it brings tears to my eyes because it was amazing to watch the love and bonding all day yesterday after she cleaned her room I was in the hallway and I heard her reading Shadow a book .I don’t know how to thank you but I do know,She must want to say hello too she just laying in my lap there is a place in heaven for people like you ! 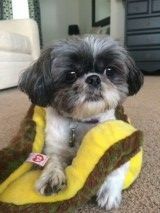 she is eating well and getting lots of love she has also done very well with potty .you can call at any time.Best Regards Timothy D.
Hi Twana, we just got home, Norm got turned around when we left the airport… She is amazing!.. 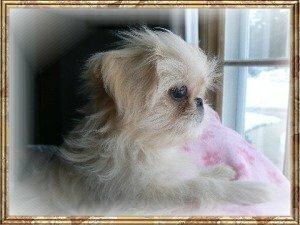 She is sooo cute:).. We love her already,..she came out of the crate wagging her tail as fast as she could and was very trusting and sweet to us right away,…then she wanted to get down in the car and play and we couldn’t let her,…she’s a little squirmy bug:).. But we made it home , and now my son is playing with her and loving on her. Thank you sooo much for her, she is so beautiful:)…I will never forget it!